After two years in development and a lively devlog on these very forums (which I then transferred to Steam via patch notes during Early Access), TANGLEDEEP is now officially out on Steam! 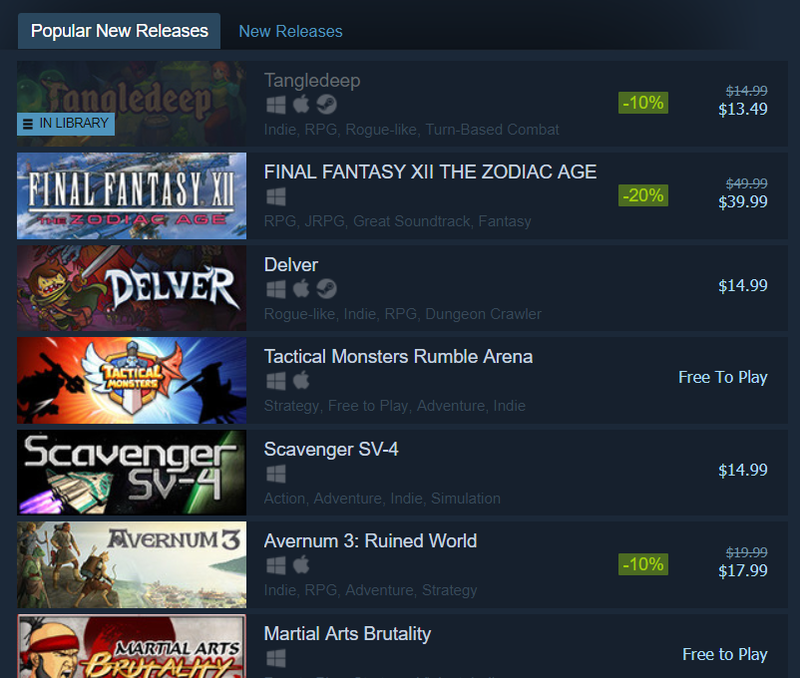 As of this post it is the #1 game in Popular New Releases, even above the remaster of Final Fantasy 12! For those that don't know, Tangledeep is a dungeon crawling RPG inspired by the finest 16-bit RPGs. It uses tactical, turn-based exploration and combat with a Final Fantasy-style job system and a procedurally generated dungeon full of unique characters, deadly monsters, and lots of treasure to find. Explore the labyrinth and discover the secrets behind its mysteries! There are a dozen playable jobs, over 100 skills, hundreds of items, and all sorts of wild Champion monster mods, magical item properties, Item Dreams to power up your gear (Disgaea style), a magic grove, a turtle that heals you, and Goldfrogs, among many other things. Oh, and you can capture nearly any monster in the game, raise it as a pet and even breed it with other monsters! Join me on Discord! Talk about the game, ask questions, and listen in on development. I'd love to have you around! Re: ImpactRL: Roguelike passion project made by a full-time music+sound guy. interesting ! nice style ! Today I spent most of my time on improving the way ability targeting works. Before, when you entered targeting mode for an ability, there was a rectangle of possible squares, and then (optionally) a cursor targeting shape like a square or line. Related to abilities... they can now have icons in the UI (basic as it is right now). Also, ability cooldowns are in and working. They even show up as red if the ability is still on cooldown. I'll put a counter or something at some point too. I also did some preliminary work on a better audio component for things. This allows me to define multiple "cues" for any given GameObject. For example a monster could have a death cue and an attack cue. Within cues, there can be multiple sounds which are chosen at random. I want to flesh this out more but it's not a high priority. As player I prefer game that let me choice from a pool of basic classes (warrior, mage or thief for example), with very different powers / style of play and then when I'm able to finish a game, open new classes with different style of play. Yes I hear you. The main thing is that I don't want to overwhelm players with choice right off the bat. I've played RPGs / roguelikes that have tons and tons of skill trees and options when there are only a few decent builds, and a lot of the abilities end up being same-y and not that interesting. I would prefer to make a smaller pool of skills that are either customizable or more versatile in their effect. For example, just throwing this out there... imagine a Cleric type class that fires a bolt of holy energy. If the bolt strikes a wall it shatters into particles. If the particles touch you, you get healed. That kind of thing. But... maybe this is just a UI thing. Like in Diablo 3, there are sort of preset ability loadouts that can be turned off for more customization. Doing it that way would mean newer players can get right into the action, while more advanced players could delve in to tweak more. Starting September with a VERY basic first pass on some UI stuff, with the much-appreciated help of an artist friend. This was a little tricky since I had to wrap my head around the Canvas, and how anchors work... but I got it looking good even when scaling the resolution / window size all around. The active weapon hotbar is working nicely too, although right now neither that nor the ability hotbar can be actively changed by the player. The weapon hotbar is just auto-filled as you pick stuff up. Next - show weapon durability, make abilities clickable! This looks fun and I like the target overlay implementation, looks quick to use but with the different shapes giving me some tactical choice too. If I may ask, how random are the outcomes of player actions? In particular, does your combat mechanic make traditionally-heavy use of to-hit and damage "rolls", or is it deterministic (or largely so, at least)? Oh yes, definitely placeholder. I'm mixing and matching some stock art. I do have a very talented artist on board now who is starting by helping me flesh out UI/UX stuff, then will be moving on to environments. 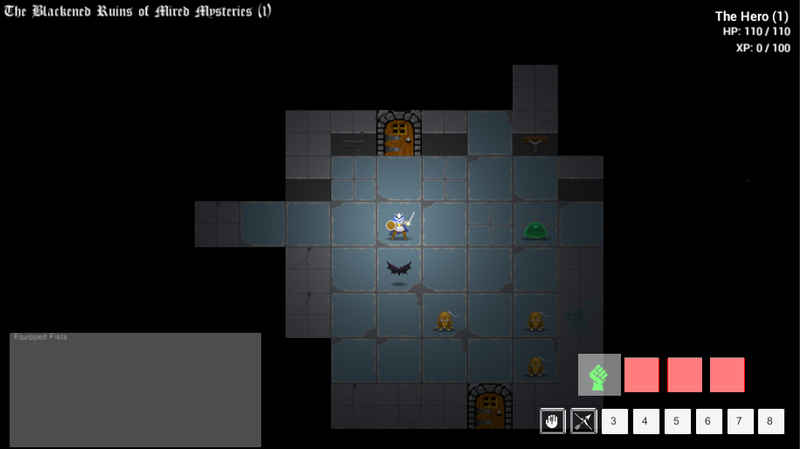 I want to try to reduce randomness a little bit compared to most roguelikes. Overall I don't want massive variance in combat that is solely due to RNG, unless that's the theme of the class or ability. For example I could see a class that has a lot of luck-based abilities, but you'd be intentionally selected that method of play, as opposed to a more straightforward one. Anyway, updates! Yesterday I implemented multi-targeting. Right now it's being used for a simple multi-shot type ability but the functionality should be extendable to a whole bunch of possible effects. The next big task I'm tackling is "Effects". This is the underlying code that will power all abilities, status effects, and many class features. It has to be very versatile and tweakable, potentially by modders down the line too. For example, I want to be able to create an ability (say, a fireball) that has multiple effects. The effects might be "ChangeStat" and "AddStatus". The ChangeStat effect might be set to reduce health, and AddStatus could add a "Burn" condition. After thinking about ways to do this, I'm going with a parent "Effect" class with a generic virtual methods like DoEffect(). Subclasses that implement this might be things like ChangeStat (which is flexible enough for buffs, damage spells, heal spells, etc.) or MoveSelf. To go a step further, I put in an excellent expression parser which allows me (or anyone) to write out things like damage formulas in XML format. And it will actually load & evaluate correctly in-game, without needing to code additional classes or functions. Can't wait to put it to the test this weekend! This showcases an ability that combines lots of tech: multi-targeting and multiple effects. First, the player selects a wall tile to jump OFF of. Then, they select a tile to jump TO. Then, they get a spread targeting cone for a multi-shot attack. That plus a little animation fun! Though there's still lots to be done, the core of this ability system already works very well. Creating new effects (either as part of abilities, statuses, etc) can be done through XML easily and stacked in all sorts of ways. It may even be over-engineered, but I wanted to make sure all the stuff I have in mind can be done properly! Otherwise: continuing to work with artist on UI/UX stuff and beginning to think about the game's overall 'tone' (dark, serious, humorous, etc) and setting. I guess I've spent so much of my time just on code that I haven't thought about that other stuff. But I'll figure something out. Hmm... What purpose does the first (wall) position serve in the jumping phase? Does it affect the placement or direction of the targeting cone? Or the available positions for the final landing? As to the camera, I fear that its sudden, sharp movement during the jumping phase might be a little disorienting. (I find it to be a little disorienting in the gif, but I'll admit that this might be related to the size of the image, or tiredness on my part.) This might be alleviated by leaving the camera static during movements of this sort (I would imagine that it's unlikely that off-screen tiles would be selected when using abilities like this). Alternatively, perhaps "soften" the camera's movement, preventing sudden changes in its position. It might also be worth implementing some additional animation frames for jumps like that, rather than starting immediately, to make the motion seem a little more natural--but that might be something to consider at a later point in development! The proper direction is clear: Darkly serious humour. Zircon himself!? Jesus, I like your stuff man! Your project looks good, keep it up! The ability there was really more of a system test than anything - I still haven't quite gotten to *actual* content yet. :-) Also the motion probably seems more extreme because the gif is so cropped. However it's also because the camera is locked on the player right now. I'll add an option that will unlock it. Don't have much to add, just wanted to say I'm following and looking forward to seeing this develop. Off topic; Been following OCRemix for 10+ years and so I certainly know your name. Also, Super Audio Cart is a godsend, been playing with it non-stop for the last couple months. If your game design ends up half as polished as your audio stuff, this is going to be very cool. Aah, fair enough, on all counts! Pixel Noise: Hey thanks for the kind words!! :D Glad you're enjoying Super Audio Cart. We're working on an awesome free update coming out later this month which makes the arpeggiator WAY better, so stay tuned for that. Regarding the "wall-jump" shown at the end, unless I'm missing a change that you've made, I think that you were right about the movement being more disorienting in the gif version--it looks much better as shown in this video, I think. Got a super rough build that is.. actually playable! Stuff works! You can explore 5 levels of the dungeon, with increasing difficulty. Harder monsters and better items spawn further down. At the bottom is an ancient golem boss; beat him to win. Now to uh.. do everything else. Lots of progress though. Wrote some dungeon music too! The goal will be to cycle music every few floors. Sounds great! I don't want to sidetrack the devlog with too much audio talk, so I can PM you if you'd like - but was just curious what VSTs you used for this; is it mostly SAC sounds? It's definitely reminiscent of SNES era sound. Will you be releasing builds for testing as you go along?